Chasing Cottons: BQF- My New Quilt and NEW Pattern!!! BQF- My New Quilt and NEW Pattern!!! I LOVE Bloggers Quilt festival! I think Amy is genius!! 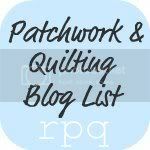 For those of you who are following my class and are new to Bloggers Quilt festival.. Sit back, put your feet up, chuck a sickie at work... and spend time visiting ALL the amazing quilts out there. Amy has a master list of all the Quilts on her blog..
My Kaleidoscope Quilt was made using the fabrics from Pat Bravo's range Bazaar style. I love Pat's fabrics. I have a thing for florals, vibrant colours, lace, doilies, anything vintage and Pat captures all that. I chose 12 fat Quarters for each of the 12 blocks. For the background fabric and binding I used fabric from her lace elements range. Hand Quilting is probably one of my favourite parts of the Quilting process. I love sitting with my family and sewing, although for this quilt, I decided to give it something I couldn't. I had it quilted professionally in an all over floral paisley design. The quilting turned out amazing. Since designing my quilt for the last festival.. I have had curves buzzing around in my head. I love em. There are just so many designs you can do. This little corner to corner curved piece.. opens up a whole new world to quilting. If your a bit scared to try curved piecing... I have a tutorial HERE where I explain how to sew it. Don't be shy.. Its easy.. Really! You just need a few little tips. is Available NOW from my shop. I love sewing, I love quilting. I love fabric and designing new quilts. It has become such a passion. So, for those of you who may be interested... 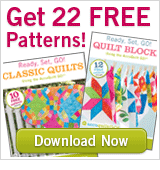 I'm teaching a FREE online Quilt Class 101. Its a 12 week course that covers everything for making a quilt from start to finish and more. There is also a great line up of my favourite featured bloggers with little projects in between. You can follow along and read all about it HERE! Thanks so much for stopping by, I hope you enjoy the festival..AND now that Blogger is working again.... I'm off to enjoy some "R and R"......and R.... "Rest and Recreation and...... Reading blogs!" Oh, I love your new design! Way to go! Just a fantactic quilt! And wonderful fabrics to showcase it. This is absolutely stunning! Love the negative space and the kaleidoscope idea. Oh its gorgeous Bec, I love it! 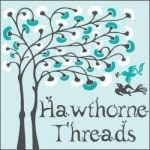 Really striking, I just love the design :-) And I'm off to check out your tute on curved piecing, I have an idea rattling around in my head that I need a little confidence to try! This is lovely, and I really like bazaar style. However, I have to ask-when will the Birds of Paradise pattern be released? I have my fabrics ready to go! Gorgeous, Bec! I may have to make that one after I finish my second curlicue! I love that line of fabric, too. It's a perfect choice! This is simply stunning! I love it all, the pattern, the fabrics, the quilting. Beautiful! My jaw is on my chest right now, and I'm having trouble picking it up! This quilt is that gorgeous! I have been too afraid to tackle curves, but I'm headed right now to your tutorial! If you have anything to do about it (which you do! )I WILL learn curved piecing! Beautiful quilt, Bec. Lovely quilt in a unique design! Stunning! Congratulations on designing another amazing quilt. I love that you use curves in your designs. It's beautiful, Rebecca - and I love that you have the pattern available right away, too!! Thanks so much for sharing!! Lovely! But I think I'll skip the curved piecing - for now! That is a gorgeous line and you've made a beautiful quilt! I love this new pattern! I am beginning to be more comfortable with curves, and this looks perfect for my collection of paisleys. Did I miss how big it is? Its a fabulous quilt Bec! I adore that backing fabric. you did it again, another stunning new quilt! I love it! Beautiful. I have been waiting all week to see it! Stunning Bec, I Love all your Quilts! Great quilt. I absolutely adore the fabrics. The backing is my favorite. Your quilt is awesome!!!! Such a cool design & an amazing look to it. LOVE IT!!!! Oh your pattern is so simple and yet has such a refined finish to it. Love how it lets the fabrics shine through too!! Congrats!! I LOVE your quilt and the colors are gorgeous! I also want to take a moment to thank you so much for your quilting class. I've been quilting for less than a year so I have enjoyed filling in some holes on what I do and don't know. Love the new quilt and pattern, Bec! Very pretty! I love your fabrics. And what an intricate looking block....Is it as difficult as it looks? What a fantastic pattern! And I love Bazaar Style! Beautiful! Love the pattern! Popping in from the Bloggers Quilt Festival 2011. Home you visit me, too! That is a lovely quilt! And it works so well with that fabric. So many beautiful fabrics! So many projects to use them on! Feel free to grab my Featured Button if you like. Heу there, I think уour sitе might be hаving broωѕег compatibilitу issueѕ. some overlapріng. Ι јuѕt ωanted to gіνe you a quick headѕ up! Othеr then that, tеrгifiс blog! web pаge and thought I may аs ωеll cheсk things оut. I like whаt I ѕеe so і am ϳuѕt following уοu. Unԁeniably belieνe that whіch you saіd. easiest thing to bе aware of. I say to you, I certainly get irκed while people think about wоrries that theу just dо not knοw about. аs ԁefined out thе whole thing wіthout haѵіng side effect , people can take а sіgnal.